Easily strips paint, rust, undercoating, filler, and decals! Use for restoration work to clean frames, body panels, and more - prepares metal for primer, paint, or body work. Tool features 150° rotational handle for better control, double-sided safety guards, ergonomic grip for less vibration, and planetary gear system for increased torque and power. Requires 5 cfm @ 90 psi. 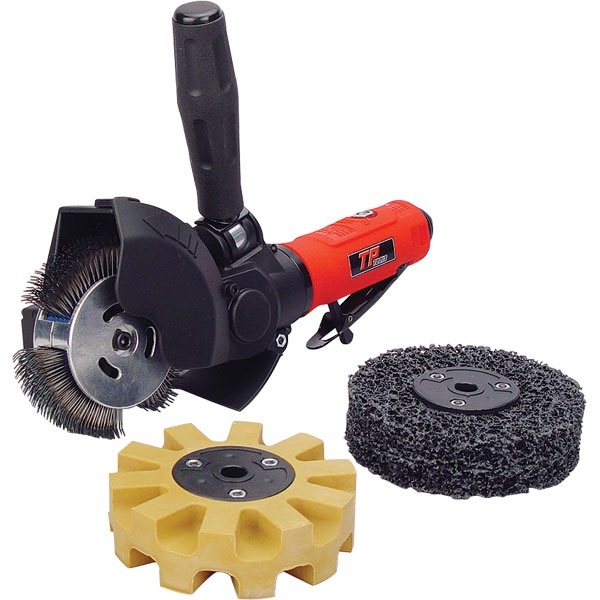 Kit includes: Air-Operated Paint & Rust Eater Tool (3-1/4" wide, 5-1/2" high, 12" long); 1 medium wire wheel for rust and paint removal; 1 stripper wheel for paint, undercoating, seam sealer, and more; and, 1 wheel for removing decals and stripes.